What flowers mean to me. All my life flowers have enchanted me; they signify to me a well loved home, a happy relationship, respect, sunshine comfort and celebration. Buttercups under your chin and daisy chains remind me of sports days and being in the brownies! Long hours in long grass. Amarylis take me to Christmas Saturdays at my Grandad’s house. I don’t think my dad ever visited a florists in Nottingham where we grew up but he managed to keep my mum’s vases full of colour and life all year round. He had many friends who worked on the markets where he would pick her up bunches of flowers week after week. I saw this as an expression of his love for her, and her arranging the flowers and placing them around as an expression of her love for our home. These flowers seemed somehow special, so pretty and ever changing. Our backyard and garden were so tiny but always well tended by mum and full of flowers too lily of the valley, impatiens and lilies. As a teenager my best friend and I would get the train and go youth hostelling. When it came to flowers Derby and its surrounding area were just an absolute delight. 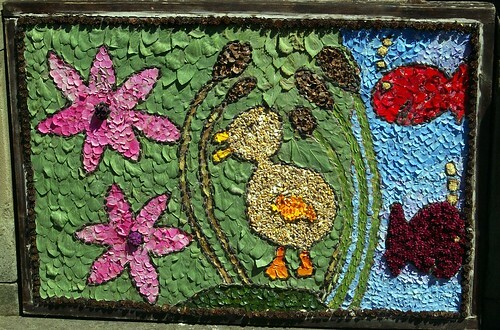 Here in the summer month’s wells springs and other water sources are decorated with designs created form flower petals and these are called well dressings. I think they are gorgeous, they look like shrines. So beautiful and so unusual. Happy days. As an MA student living in Hull and dealing with the harsh realities of social work I began to paint beautiful things to find some balance. I would search florists in Hull for single, perfect flowers which I would spend my meagre grant money on. I would treat myself to just one a week. I would draw or paint or chalk these flowers spending hours looking at their perfection. My husband doesn’t buy me flowers too often but when he does he buys very many all at once. My children draw them for me or paint them and these are so special. My wedding bouquet was a tumbling rose perfection. Nothing ever smelt as sweet as the heavy perfume of my Granddad’s roses. I remember heartbreakingly beautiful flowers bought for heartbreaking losses, flowers to celebrate births, for break ups, for sad and glad days. Flowers for thank you’s. Expensive flowers and handpicked flowers. All part of my life story. I have loved flowers all my life. Flower are one of beautiful things in world.Flowers have impact on personalities and for me it means the peace,serenity with discipline and care.